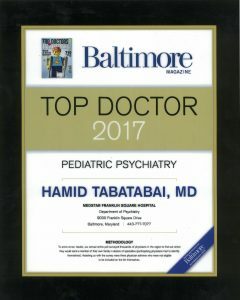 CAPS Unit – Hamid Tabatabai, M.D. The Child and Adolescent Psychiatry Services (CAPS) is an 11 bed unit for diagnosis and treatment of acute psychiatric disorders in adolescents (ages 11 to 17), at Franklin Square Hospital. The unit has been in existence for several decades. I have been its medical director for several years. It is the most comprehensive short term psychiatric unit anywhere, in my opinion (then of course I am biased!). We have two licensed psychiatric social workers who provide comprehensive psycho social history which is an integral part of the psychiatric evaluation and treatment plan. Each case receives 2 family therapy sessions and the complicated cases receive more. We are, to my knowledge, the only unit that has for years, hired a senior family therapist who provides on going additional training and supervision for our therapist and the entire team. The evaluation and the treatment plan, is done and formulated within the first 24 hours by one of the two board certified Child and Adolescent Psychiatrists with many years of experience.Our team includes well trained and competent psychiatric nurses, experienced mental health workers, and activity therapist. The therapists and nursing staff attend medical and clinical rounds and are an integral part of daily assessment and treatment plans.Any visitor to our unit can immediately sense the commitment of our staff to the care for the children and their family and sense the enjoyment that they get from working as a team. We have one of the highest staff to patients ratio of psychiatric units. It lets us provide attention, supervision, and therapy for each patient. In addition to a 3-4 daily therapeutic groups, every patient receives a 1 to 1 individual talk with one of the staff on a daily basis, and individual discussions prior to the family meetings. we have one of the most structure B-Mod programs. While we give each patient much empathy and therapy, we also are very firm with our expectation and its enforcement. Parents are relieved that we do not “get fooled” by manipulative patients and do not allow acting out that is detrimental to their own treatment or that of others. You can forward any questions or comments to me through the email of the web site.